The Silk and Spice Festival is held in my home city Bukhara, Uzbekistan each year in May. Ancient Bukhara is known as one of the most peaceful historic destinations in Uzbekistan. Intricate tile work on mosques and minarets glitter in the morning sun, shaded chaikhanas with comfy divans await a leisurely chat and fresh tea, and the stalls and shops of traditional craftsmen and artisans from throughout the Silk Road countries are tucked behind the adobe walls of the old city which glow warmly in the desert sunset. Yet once a year tradition breaks free and explodes across the city! The exuberant Silk and Spice Festival is eagerly anticipated by residents and visitors alike. 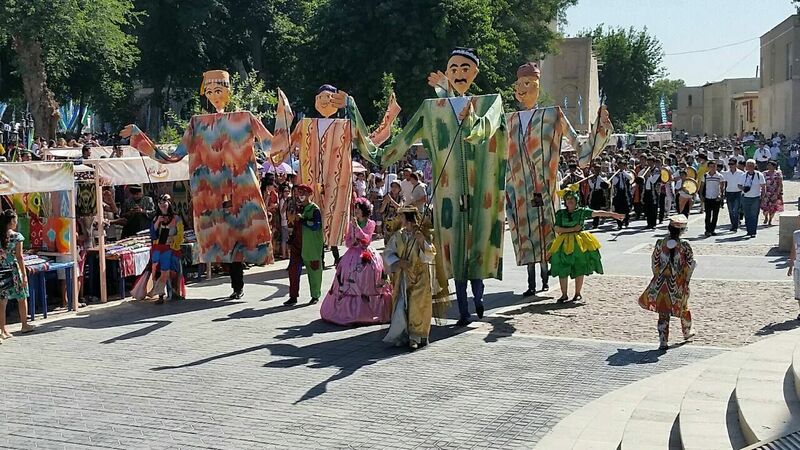 In a celebration of cultural heritage, dance troupes and musicians in brilliant national costumes lead lively performances and parades joined by puppeteers and tightrope walkers. Skilled craftsmen from Uzbekistan and neighboring countries display carvings of fine woods, bright copper, brass and silver work, handcrafted jewelry set with semi-precious stones, unique regional ceramics, luxurious silk carpets, dazzling ikat fabrics and intricate gold embroideries - the hallmark of Uzbek finery. Rounding off the festival is a continuous offering of the best of local cuisine. There are grilled kebabs and savory plov by the best oshpaz (chefs), local breads of all kinds, and savory pastries stuffed with meat and vegetables, wine tastings to pair them with and halvah to satisfy that sweet tooth.